Hi everyone. My name is Steph Ackerman and I am thrilled to be guest designing this month for Eclectic Paperie. This store is full of amazing products and I had a hard time deciding exactly what I wanted to work with. I knew I wanted to create a canvas, but I had no idea exactly what I was going to do with the canvas. I generally have no idea what I'm going to create, so I just pulled out some supplies and played around. After all, isn't that what creating is all about? 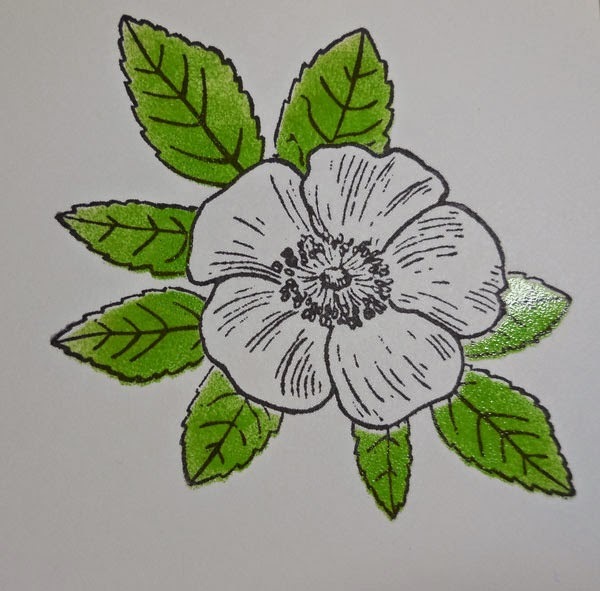 I selected Wendy Vecchi's Stamp It Stencil It - In Full Bloom - to work with. I love stamps and I love stencils so seeing them working in harmony was going to be fun. 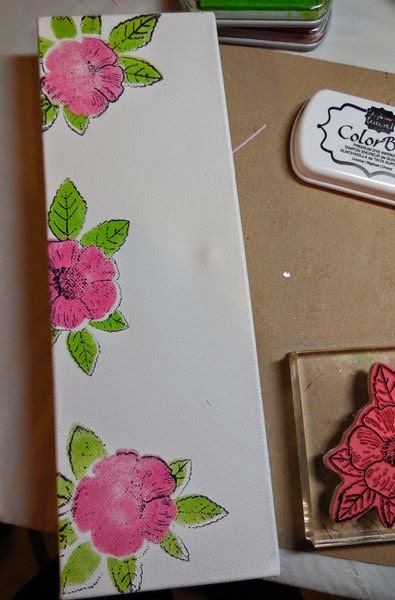 I stamped the leaves along the side of the canvas first in ColorBox Limelight Ink, then added the flowers with ColorBox Berry Ink. Since I wanted to work on my canvas without waiting for it to dry, I used a Ranger Heat It Craft Tool. This way I could dry my elements and continue to work. I stamped the flowers in black ink on top and as you can see, I didn't get a wonderful impression. Honestly, I was ok with it because I knew I wanted some dimension and would "fix" this issue later on. 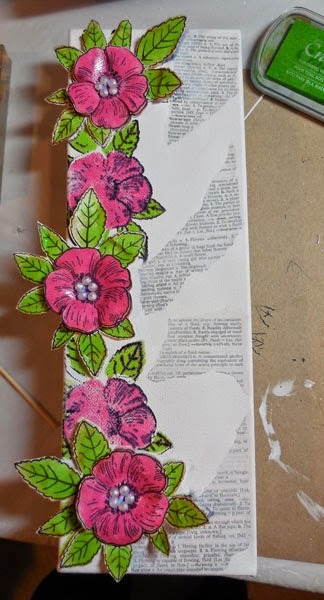 After stamping the 3 flowers, I created masks of the flowers so I could add 2 additional flowers between them. Then as I wanted the flowers to be 3 dimensional, I stamped, colored and fussy cut 5 flowers. 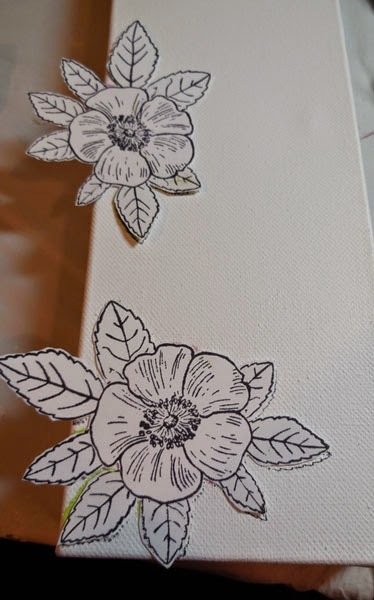 I placed Glue Dots between the flower layers for a little dimension. Some Robin's Nest Dew Drops finished off the centers of each flower. I used Claudine Hellmuth Gesso to adhere torn strips of book paper to the canvas before spritzing with Art Anthology Patience. 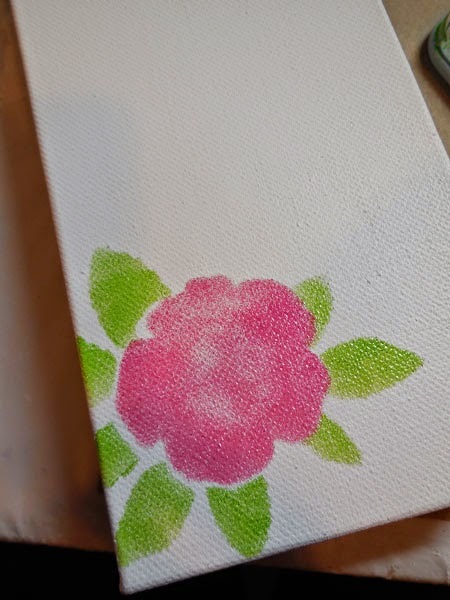 It dries very quickly and I was able to add color around the outside of the canvas using the Inkssentials Foam Blending Tool, with Ranger Distress Ink in Worn Lipstick and Tattered Rose . I probably should have added the book pages before I began my project, but a work in progress takes on a life of it's own, doesn't it? I loved the Prima doll stamps when I first saw them. While a little big for cards, I love how well they work with a canvas. I used Pocket Doll, fussy cutting her as well as the dress. I redressed her before adding her to the canvas with foam adhesives for dimension. A little ink in her hair and headband and she look lovely amongst the flowers. I had some tiny stickers in my stash and used them to provide the phrase - "stop and smell the flowers" which I placed around my gal. Here is a close up of the gorgeous flowers. I hope you enjoy this canvas as much as I did creating it. Thanks so much to Kim and Bonnie for inviting me here this month and thank you for stopping by today. Lovely project...the flowers and the vibrant colors are gorgeous. Great way to use these over-sized stamps. What a beautiful canvas. 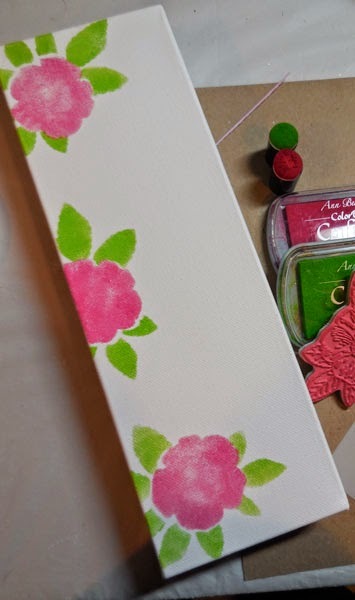 Love your mix of flowers with the doll stamp. They work great together. What a great canvas, Steph and welcome as the guest designer this month! Your flowers are beautiful with the colors and pearl centers - and I just love that pocket girl!! I love how you created depth with the flowers! And I had to chuckle about adding the background papers. I do that sort of thing ALL the time!!!! Your canvas is gorgeous!!!!! I absolutely love this canvas. Thank you so much for all your creative ideas! Oh dear.. Love your canvas. 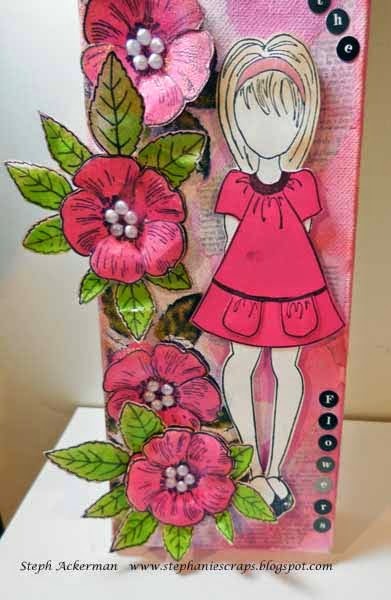 Such a great idea using all those pretty flowers together with the Prima doll stamp. Love your result. I love the way you layered and grew dimension on the canvas. Adding the girl is perfect! Welcome as Guest Designer, Steph! LOVE your Gorgeous flowers and the Prima girl! Absolutely adorable canvas. Love what you didi with the stencil/stamps. I love this piece of art. I adore her pigeon toes! very very cool!